Pop quiz, hotshot! You’re at a diner. It’s breakfast time. The waitress approaches your table and everyone else seems to have made their decision. What do you order? Cereal? That’s for amateurs. Scrambled eggs? C’mon, you can get those anywhere! What about an omelet? Getting closer, but that’s still not what you REALLY want. You want something that allows you to basically eat dessert for breakfast. You want a big old stack of waffles that are just doused in maple syrup and butter. You want the mighty waffle. Yes, the waffle. The sweet batter that’s cooked to a golden crisp in a hot iron is always the right choice when forced with a difficult breakfast decision. It is the conqueror of breakfast. All other breakfast foods bow down to it. The only thing that even comes close is the pancake and even the pancake can’t compete with the waffle’s supremacy. 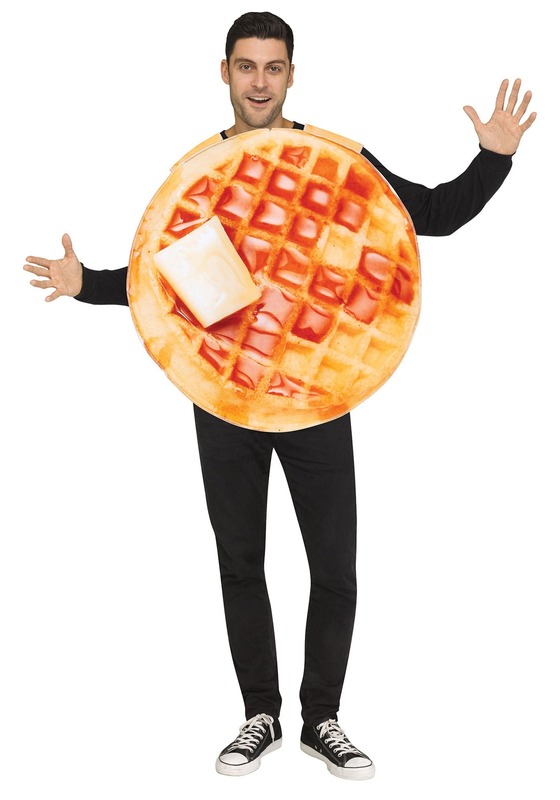 And if you’re planning on dressing up like any food item this year, then you want to dress like the conqueror of breakfast. Based on the best breakfast food of all time, this adult waffle costume does a great job of making you look like one delicious serving of waffles. It comes with a tunic-style top that has a realistic print of a buttery waffle on the front and back. It also has the appearance of loads of syrup to finish off the look. You simply wear this tunic over your normal clothes to instantly conquer breakfast! 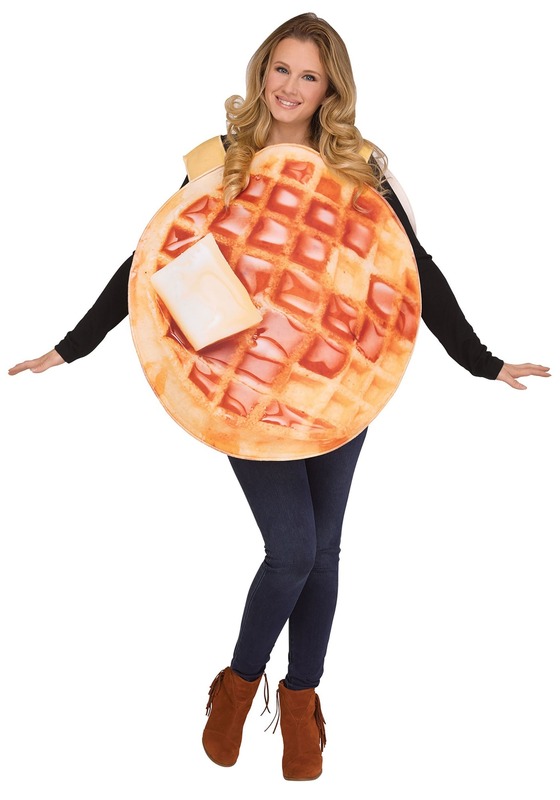 Now, this adult waffle costume is quite appetizing on its own, but to get a fully balanced breakfast group costume, you may want to check out all of our food costumes. 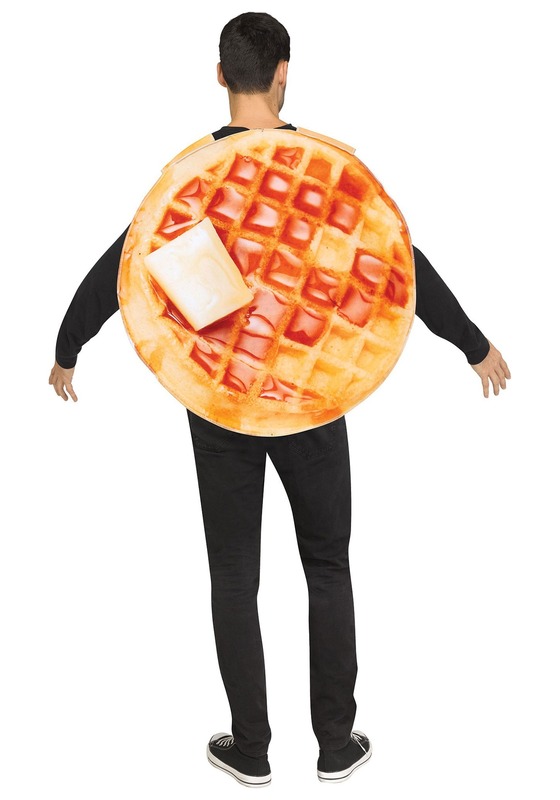 Also, you apparently get bonus life points by wearing this costume while you order waffles at a breakfast diner.